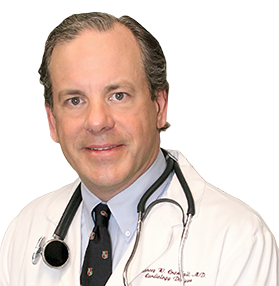 If you decide to visit Dr. Crandall’s Web site, chances are you already have health concerns. Maybe you or a loved one has had a heart attack, suffer from angina, have been diagnosed with high cholesterol, is battling hypertension, or just want to prevent heart disease. Dr. Crandall has had many of the same concerns and experiences as you. As a heart patient himself, he knows what it’s like . . . He fought heart disease and won — and so can you. By making changes in your life, you can live a life free of heart disease, free of prescription drugs, and free from stress. 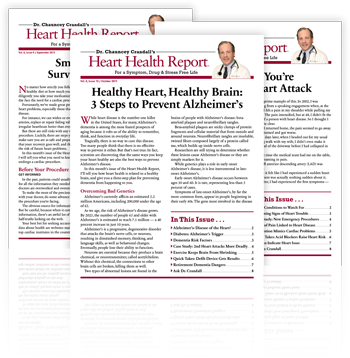 And you can get started on your road to a healthy heart through his newsletter Dr. Crandall’s Heart Health Report. Each monthly issue contains effective strategies for fighting heart disease. These are the same strategies that Dr. Crandall uses with his own patients — and on himself. In writing about these strategies, Dr. Crandall draws on the latest studies and most advanced thinking. He firmly believes that there is a time for both conventional and for alternative treatments. However, Dr. Crandall’s major goal is to give you information you can use immediately to help prevent — and reverse — heart disease. In addition, each issue will have a section of “quick takes” — action-oriented tips about promising new treatments, effective medications, the use of supplements, dietary and exercise considerations, and so forth. These should provide you with several things you’ll want to do right away as an aid to your heart health. Then Dr. Crandall will respond to your questions about your heart. In fact, he looks forward to receiving your correspondence and offering as much advice and support as possible. He considers each issue your opportunity to enjoy a “virtual visit” with a cardiologist. Plus, every newsletter will also include a fascinating case history. These case studies will go far beyond the patient’s medical history to show how their life has changed after becoming well. Heart disease can be not only debilitating but also dispiriting. Dr. Crandall wants you to see that there is hope. Even if you’ve already been given a diagnosis of heart disease, you’ll find you have so much to live for.